Vegan roasted tomato soup with Instant Pot is a simple, healthy and most comforting soup. This easy homemade soup is dairy-free, paleo, whole 30, keto with oven roasted tomato, onion and garlic. Perfect to serve for lunches or weeknight dinners. 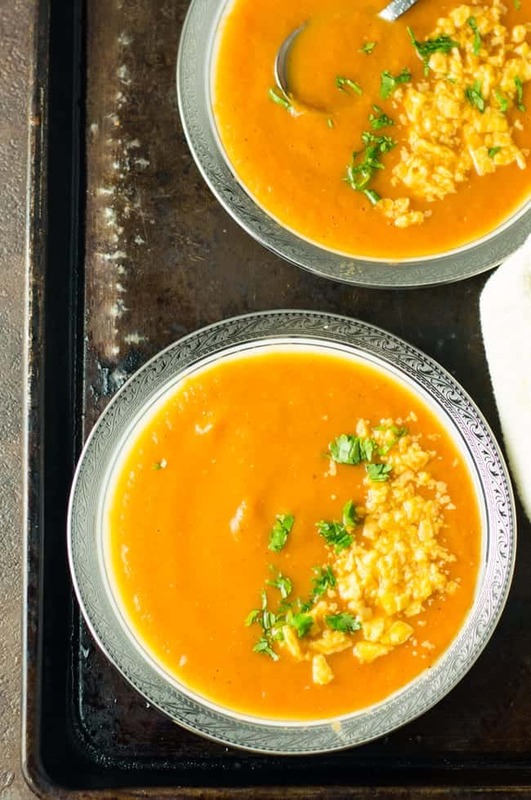 This recipe is a lazy man’s Instant pot recipe for the creamy roasted tomato soup. Moreover, this was one of the first few restaurant style recipes which I learned to recreate in vegan style. To my surprise, this turned out to a big success gives me the confidence to try out more copycat dishes at home. After our tiresome New York day trip, I do not want to spend time in the kitchen. All we wanted to have is a mild, soothing soup. I do not want to give any twist to the recipe. I also want to speed up the cooking processes time. Healthy, skinny vegan roasted tomato soup made just with onion, the garlic, and no other fancy pantry items. It’s so quick to make with only four ingredients. Is it not a pleasant surprise? So if you feel to have soup and not want to spend time searching for the ingredients, this soup be the best choice. This vegan roasted tomato soup is a comforting meal I can have with my family on the pleasant cloudy day like this. Today’s vegan roasted tomato soup is more convenient and efficient to make. Thanks to the instant pot for its simplicity. If you would like to make something more exotic and have a bit more time with the recipe, you can add more vegetables to this roasted soup. I did not add anything other than minced cilantro for the flavor. The olive oil we added while roasting the vegetables gives a whole round of the taste to the Vegan roasted tomato soup. It is a pleasing contrast to the tangy tomatoes. But does compliments the soup well. This is the basic recipe of tomato soup, but it is indeed flexible. You may add red peppers, sweet potato, eggplant or any other vegetables while roasting. Every addition of each vegetable brings a new flavor and taste to the recipe. So keep experimenting with them, and discover pleasant surprises. Just make sure to roast the vegetables before throwing to the instant pot. If you’re looking for wholesome soup for dinner, you may try this vegetable tortellini soup. Or if you are searching for hot and sour soup try this Hibachi soup, which is also vegan. Instant pot reduces the cooking time to the half. And to our pleasant surprise, we are making vegan roasted tomato soup without messing the kitchen. And you don’t need to roam in the kitchen just to keep an eye on the cooking range. The instant pot does those things for you. After throwing all the vegetables in the instant pot, you can forget about it. And can open whenever you need it. To the pleasant surprise, it will be kept warm until we use it. Tomatoes: I feel plum and cherry tomatoes are right to make this soup. They have the subtle flavor and tastes great for the soup. Roma tomatoes make the soup sour, where you need to compliment with red peppers or jalapeno. Onion: Yellow and sweet onion is good for the soup. You may add fresh basil leaves at the time of a serving. This adds whole new flavor and makes it like Italian style roasted tomato soup. 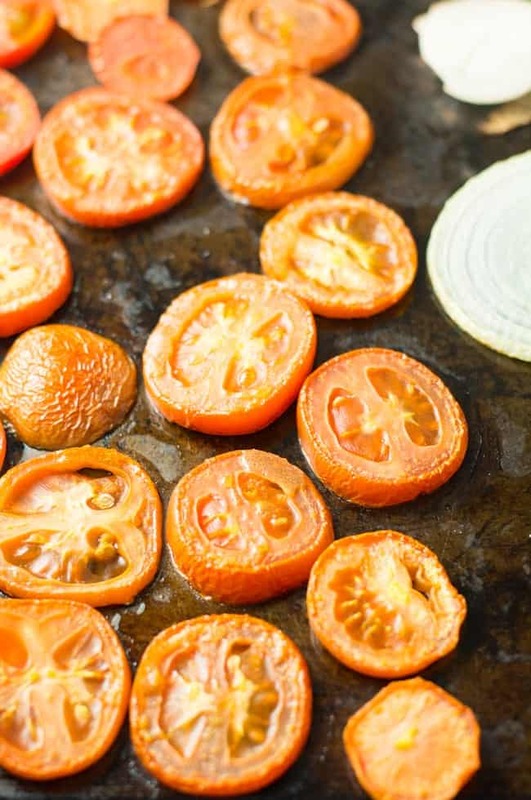 Add red pepper while roasting tomatoes and onion. This gives you beautiful rich flavor to the soup. You may also add vegetables like carrot, pumpkin, butternut squash roasting tomato, and onions. If you are not too sensitive to the spices, you may add roasted cumin powder before serving. Try adding a smaller quantity of cumin powder, taste and adjust accordingly. Add roasted deseeded jalapeno. And make Mexican style soup effortlessly. 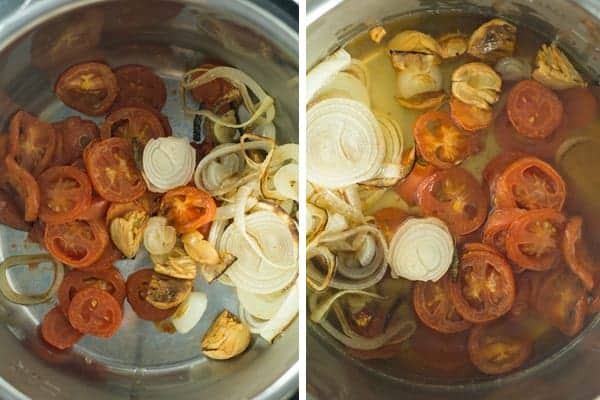 How to make vegan roasted tomato soup in an Instant Pot? Preheat the oven to 400degree Fahrenheit. Firstly, slice tomato, onion. Secondly, peel and crush the garlic slightly. Arrange these on a baking tray. Then drizzle olive oil over the vegetables. 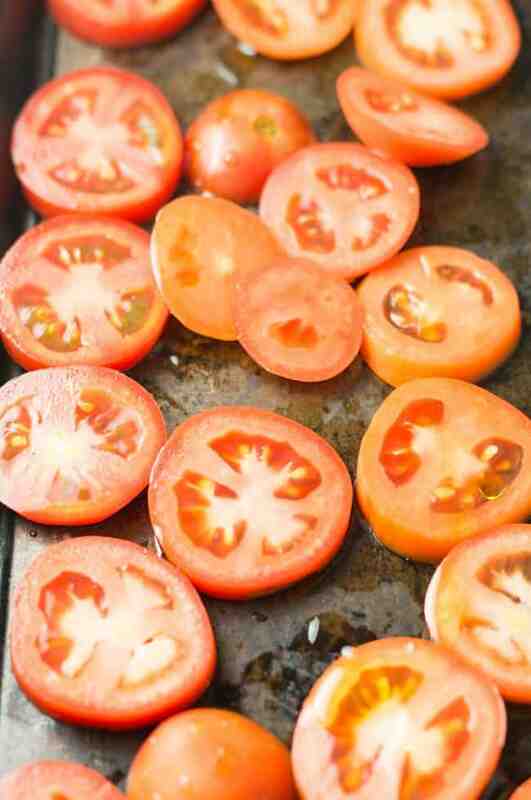 Bake it in the oven for 30 minutes or until the tomatoes shrink down by 30-40%. Add these roasted vegetables to the Instant Pot. Then add 2 cups of vegetable broth and one cup of water. Close the lid and set the timer manually for 10 minutes. Allow the pot to release the pressure by waiting for 15 minutes. Then using the hand blender, blend it to smooth and silky consistency. Add salt and crushed black pepper. Transfer to serving bowl. 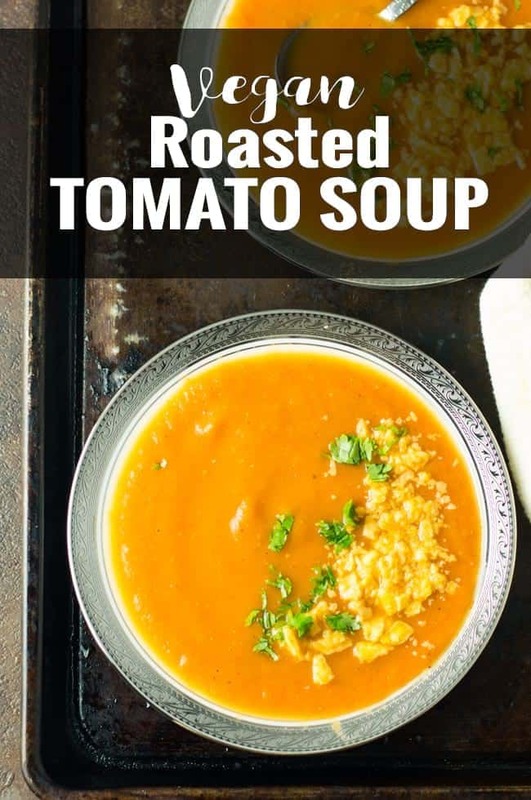 Sprinkle minced cilantro and croutons on the top and serve Vegan roasted tomato soup hot. Vegan roasted tomato soup with Instant Pot is a simple, healthy and most comforting soup. This is the easy homemade soup is dairy-free, paleo, whole 30, keto with oven roasted tomato, onion and garlic. Perfect to serve for lunches or weeknight dinners. 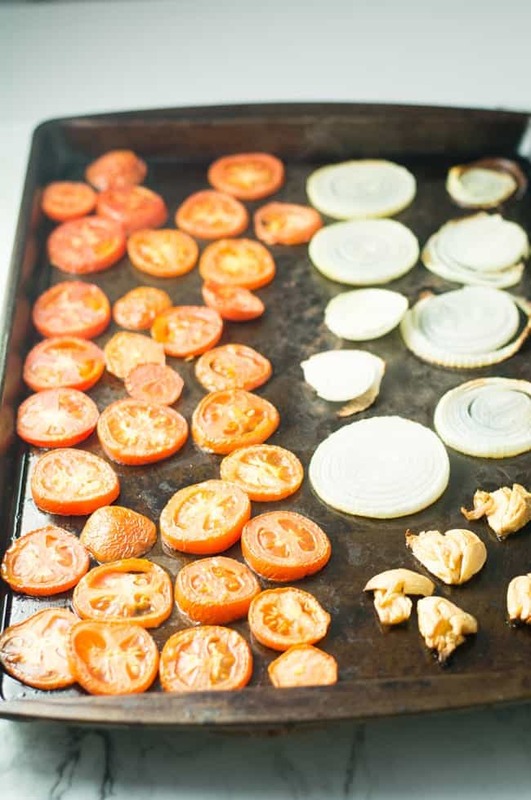 Arrange the sliced vegetables in a baking sheet. Add these to the Instant pot container, along with vegetable stock and water. Set the Instant pot timer for 10 minutes. Allow it to cool down. Once the pressure is released, blend it to the silky consistency. Transfer to serving bowl and garnish with minced cilantro and croutons. To store the leftover, You may use a sealed container. If stored properly in a sealed container, it stays good for two days in the refrigerator and two months in the freezer. To make it protein rich, you may add shredded chicken.